What was once the nation’s premier Army post is now a vibrant 1,500-acre national park offering spectacular vistas, rich history natural beauty, and opportunities for recreation, entertainment, and play. And the new state-of-the-art William Penn Mott, Jr. Presidio Visitor Center offers and incredible array of experiences to visitors to help them discover the Presidio. 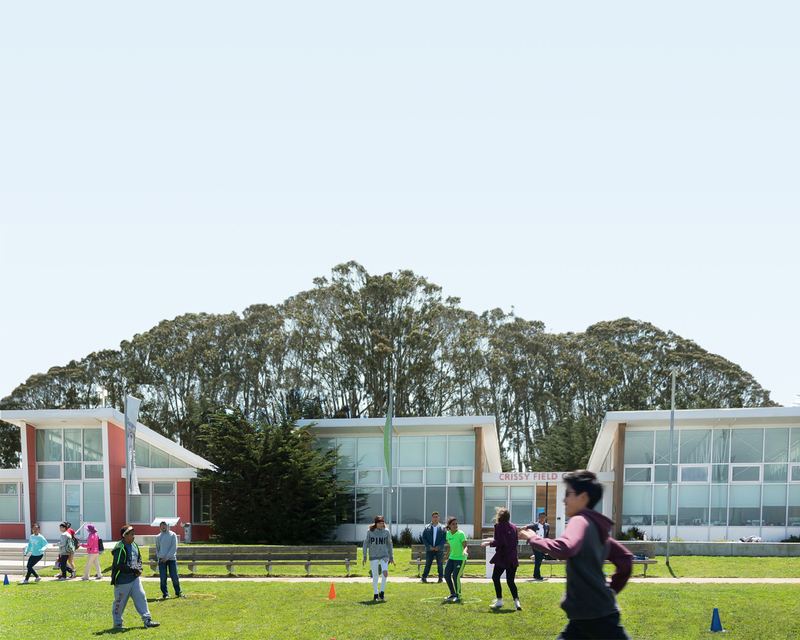 Using inspiring video, engaging exhibits, and interactive tools, this is the park’s new “front door” and the launching pad for your Presidio adventure. The center is staffed with knowledgeable staff and interpreters to help visitors. The Presidio Visitor Center is housed in a refurbished historic (circa 1900) guardhouse in the heart of the park with views overlooking the Golden Gate Bridge. The Presidio Visitor Center offers some of the most cutting edge and interactive exhibits in the national park system. Just inside the entrance is a large-scale Presidio model surrounded by touchscreen panels that help visitors select destinations to visit during their day in the park. A large video wall features a calendar of daily events and dramatic imagery of the Presidio. Other exhibits include a “Voices of the Presidio” display in which several community members use shadowbox art to share what the park means to them. Additional exhibits showcase the history and natural setting of he park’s major regions: the Main Post (the cultural heart of the Presidio), the Golden Gate (iconic views), Crissy Field (recreation), and the Southern Wilds (nature exploration). In conjunction with the visitor center’s exhibits and orientation features, the interpretive retail area is a dynamic environment that offers changing high-quality merchandise interpreting the many themes of the Presidio and tools for exploring the parks. Envisioned to educate, engage, and inspire, the Presidio Visitor Center’s interpretive retail offerings are divided into two areas: Park Tools and Park Learning. To help visitors enjoy a day in the Presidio. Easily accessed in the south/orientation room and includes books and products to help visitors enjoy their time in the park. Park Tools encourage visitors to explore the outdoors: hiking, biking, and walking guides to find stunning landscapes and splendid views; blankets and outdoor dining ware for picnicking on the great lawn; sporting goods for open-air recreation; clothing for the often cool climate; and commemorative gifts and park merchandise that celebrate the Presidio and the Golden Gate National Parks. Items used for more in-depth exploration of themes like nature, history, or conservation. Found in the north exhibit room, this is dedicated to more in-depth information offering visitors a curated selection of publications and products to further explore and appreciate the Presidio’s rich historic and natural resources. The evolving product mix includes the latest published materials and innovative items available, both from the general marketplace as well as the extensive list of publications and products developed by the Parks Conservancy’s award-winning retail team. With a significant focus on educational, interactive, and inspiring items for adults and kids, the Park Learning area sparks visitors’ imaginations and interests in nature, history, conservation, and learning. The Presidio Visitor Center will provide access to all parts of the Presidio and exemplify the American ideal that our national parks belong to everyone. We are grateful for the generous gifts to the Parks Conservancy from the Lisa and Douglas Goldman Fund, the Horace W. Goldsmith Foundation, and the William Penn Mott. Jr. Memorial Fund to make the dream of a visitor center a reality. Created in conjunction with the opening of the William Penn Mott Jr. Presidio Visitor Center, this park identity image created by Marin artist Michael Schwab reflects the grand, historic, main post and the Golden Gate Bridge near where the Visitor Center is located.